For generations, man has tried to succeed himself in every way possible. There was Caesar, then Napoleon, then there was Hitler. If we were take this statement into the video game industry people will say that first there was Mario, then Sonic�perhaps Tomb raider and Zelda. However, there has been one game on everybody lips that have had even the avid Nintendo fan excited like a little child. Sega fans have waited for a long time, but ladies and gentleman�the wait is now over�I present you Shenmue. You have probably heard so much about this game already, but I have the wonderful pleasure of reviewing this game. Except, upon playing it, I found myself with a very difficult task. How can a game of epic proportions be explained with simple words from the dictionary? So I have chosen famous quotes from greats like Mark Twain, William Blake and William Shakespeare to aid me in my review. However, first, I am going to explain what FREE really means�to be honest, the best people to explain are Sega themselves, so here it is. Investigate whatever you want to investigate. Here, the passage of time is realistic. Melds slowly into a quiet and still night. When it rains, it rains. When it snows it snows. At times it continues without letting up. Everyone living their own unique everyday lives. Yes, this is a real world. Now do you see why that when people brand this as another RPG they are sorely mistaken? Shenmue isn�t about being quick, and it�s not about taking your time�it�s about being yourself. You take control of Ryo, one day you come home to find your father brutally murdered by a man who uses a deadly style of karate. So you decide to take revenge. That�s where it all starts to show its glory. 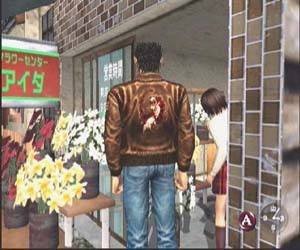 In Shenmue you can interact with almost anything, and everything is in 3D. No more of those bitmap images, every tree is sculptured and every one of them is unique. The control system is simplistic and easy to learn, however, you must bare with this game for about the first two hours as all the Japanese names and the sheer size of it all may just bore you. But wait, stick this out and I promise you with my money that you won�t let go, I played for 8 hours non-stop without taking a break. I have been playing games for years but not one game has had that effect on me. The graphics in Shenmue are simply astounding, in actual fact, not one word will do it justice. Every character moves with a style, the animation of faces is awesome and the way snowflakes flutter to the ground is simply stunning. I have yet to see a game on PS2 to better this. Then there are the actual fight scenes... incredible. The QTE (explained later) really show off the art. 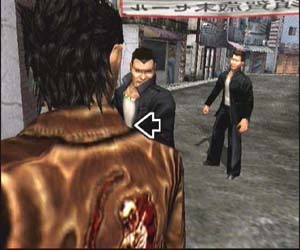 Even the normal combat system flows from your fingertips when taking on a gang, because the fluid animation runs like water. If you worked at AM2 you will realise that to them pop-up is not a word, because in Shenmue it doesn�t exist. For me personally, I believe that sound is one of the most important features in any game. It is what sets atmosphere, it can be what determines where to go. Shenmue has redefined the way you look at games. If you enter a convenience store, you will be treated to a catchy beat, walk down the street at night and erie music will occur. Orchestras have been used superbly, I even hear that in Japan you can buy the Album of Shenmue! Then we come onto the voice acting. Well, do not fear, they have managed to pull it off well with only a few annoying characters. Yet, when you consider that every single character has their own tone, pitch and amplitude, it makes you wonder how they crammed it onto 3 discs. And in real life you do get people with annoying voices! Yu Suzuki, the man responsible for Shenmue, would have certainly looked at that famous quote, because he has implemented it brilliantly. 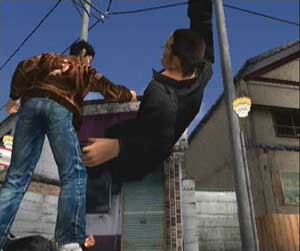 Detail is what makes Shenmue so different from all the rest. You can use the phone, you can catch a bus to work that runs on a timetable using the games internal clock (one day lasting one hour of our time) and you can even meet people the next day at a certain time. Every single person has his or her own life. To prove this theory myself, I went to spend a whole day with a character and see if it was possible. The man woke up, got on his bike, went to the shop he runs, opens it up, then goes on a lunch break to the local arcade (with full versions of Space Harrier and Hang On) then returns to his shop. Later when he closes up, he goes to the local bar to have a quiet drink then he is off to bed! It is overwhelming, one that will take games into a new revolution of detail. Magic weather is a new system designed by AM2. This is completely different to what you get in formula one games! As you walk around you will notice that the sun will rise and set. Gradually it may rain or snow. However, if the weather is relentless for a few days, then the scenery outside will change! It is absolutely beautiful. Then you walk around the shops at Christmas time to see actual decorations up! QTE or Quick Timer Events usually occur randomly. Much like the Die Hard arcade system that when a button comes up on screen you must press it within an allocated amount of time. If you succeed then you may catch something or beat someone up! However, if you fail prepare for the consequences. It adds great suspense because when a cut scene happens you will have your hand trembling on the pad waiting for something to happen. There are also battles where you control the fighting. This is easy to use, perhaps a little too easy! You will look at Shenmue more as a second life than a game. Even when you are watching television you will be thinking, �don�t forget to meet that guy� only to realise that you got your worlds confused! Shenmue is your second world that will engulf your mind. The story is brilliant with some excellent scenes. To finish off, I give you my few problems with Shenmue. It is too easy; I was on the 3 disc in the second day! However, everytime you play, it�s a new experience. There is a minute amount of slowdown when a lot is happening on screen; however, the situation is rectified immediately. Then I come to my last major fault of Shenmue�that is�one day you will realise that this is just a game, one day you will finish it and it will all be over. Take a look at my reviews I have done, it certainly wouldn�t be an unfair statement to say that I�m the harshest reviewer. But with a game like Shenmue it is hard to fault. 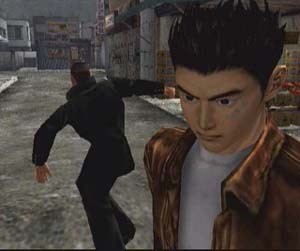 If people dislike the game, then that�s fair enough, but if people say they hate it, then it is not Shenmue they hate, but gaming as a whole. Shenmue is pure class, and so I end with my own words of wisdom! This is not a revolution; instead it is an evolution! 10 Simply gob smacking. Shenmue is in a class of its own. PS2�do not be afraid any more! PS2 is nothing compared to this. Sound 10 �Great music is that which penetrates the ear with facility and leaves the memory with difficulty. Magical music never leaves the memory.� Enough said about that! Gameplay 10 Give it time to explore your mind, because once it does, that will be the end of your social life. A joy to play. Perhaps a little too short, but replay value is high and each time you play it is different. 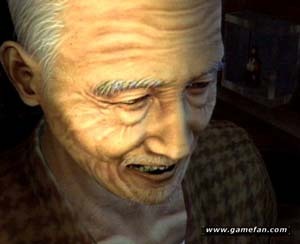 "No game is perfect, but by heck, Shenmue comes dam close. If you only get one game for your Dreamcast, then this is it. An epic game with epic possibilities for the future. Evolutionised gaming as we know it." Once in a Millennia a game on a scale beyond that of anything ever made before comes along. Shenmue is one of those games! Don�t get it for the graphics, don�t get it for the sound, and don�t even get it because it plays so well! Get it because it�s an experience so far unmatched by any game (if I should even call it a game). Everything about Shenmue is awesome! I wouldn�t go as far as to say it interrupts with your real life, but it�s the most absorbing game I�ve ever played. It may get repetitive at the beginning; the arcade may only have 2 real Sega classics (Space Harrier, and Hang on. Retro buffs might well find the �40 worth in the arcade alone, I wasted many an hour in here) the plot might seem a bit far fetched, but after the first few hours, you�ll soon look beneath these and find a gaming experience which no other game on any format which has ever existed comes close to matching! If this isn�t in your collection, then get out of my sight!